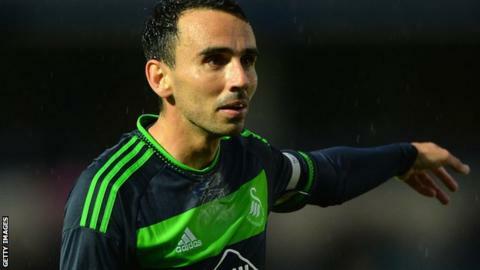 Midfielder Leon Britton says he is staying at Swansea City following talks with manager Garry Monk. Britton, 32, had been linked with a move to the United States having fallen down the pecking order at the Liberty Stadium. But the former West Ham United player wants to stay and fight for his place. "I spoke to the manager about two weeks ago and it was decided that the best thing for me was to stay here," he said. "I've always said the first place I want to play is here at Swansea. Maybe things will change a bit and I can be involved a bit more, which would be great." Britton came off the bench to make his first appearance of the season in the 2-0 win over Newcastle United but his opportunities in recent seasons have been limited. Jack Cork, Ki Sung Yueng and Jonjo Shelvey are ahead of him in the midfield pecking order with Matt Grimes and Jay Fulton coming up through the ranks. Merton-born Britton revealed in July that a number of Major League Soccer teams had shown an interest in signing him but no firm offers had been made. Britton, in his second spell at Swansea, has played in all the top four divisions since 2002 but made only nine appearances last season. He helped Swansea avoid relegation from the Football League and rise up the divisions to become a top-eight club in the Premier League. In 2010 he left for Sheffield United but returned to Swansea just months later, playing almost 500 games for the club during his two spells.